This could easily be a rant based on some recent customer service experiences but I’m going to avoid that and instead look at what companies are facing today in trying to meet customer expectations. 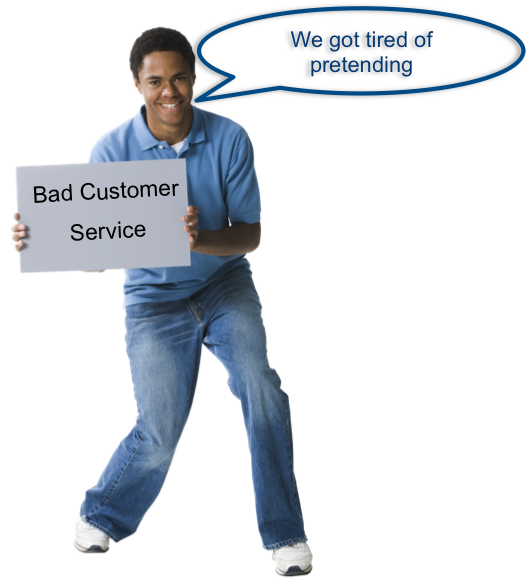 I read recently that Comcast has finally appointed a VP to try and address their extremely poor customer service (I’d say customer service image, but let’s be honest, it’s not an image problem so much as it’s an execution issue). That announcement coupled with some personal experiences with two banking institutions recently got me thinking about customer service again. Customer experience is an overused and over discussed topic maybe, but it is, I believe both relevant and necessary. The customer has experiences with your brand at every interaction, the question is whether the experience is positive, neutral or negative. Meeting customer expectations is hard for a lot of reasons. Just the simple concept off meeting something that changes and is highly individual is itself daunting. How do you even know what the customer expects? Well, of course there are some basic concepts that you have to meet, like if a customer calls someone needs to answer, but beyond that, what constitutes a positive experience for an individual customer and how do you figure that out? So that’s certainly part of the problem, understanding a customer’s expectations isn’t always a straightforward thing. Beyond that though, I find that many businesses have some fundamental issues that make solving customer problems and issues really difficult. There are things you can do to gain insight into expectations of course, but even without those, there are some simple things that companies seem to struggle with. In fact I find that a lot of customer discontent is caused by a few mistakes. To understand this better let’s look at a couple of personal examples. The first is with a bank that I’ve used for many years, Union Bank. Now in general the reason I’ve stayed with them as long as I have is pretty simple, they understand and deliver good customer service. I mean customer service in the old fashioned “this is my personal neighborhood banker” way, even when I’m 3000 miles from the closest branch. So recently I had an issue executing a transaction remotely, mostly due to some arcane banking rules. The initial customer service experience was surprisingly unhelpful and missed my expectations completely. I was shuffled around to many people and no one wanted to own solving my issues. After wasting a half a day or so on it, I tweeted in frustration. Now this is where things changed dramatically. The response to the tweet was almost immediate and moved to another more private channel where an escalation representative with 2 important attributes took over. That person had ownership of the problem until it was resolve AND the position power to get it resolved, even though it involved being creative about how to deal with things. The net, would I recommend Union Bank (and have I), without a doubt, yes. The 2nd issue is also with a bank. Because of the 1st issue I decided that there are some transactions that are easier to handle with a local banker in person, so I decided to open an account with another bank (not to replace my account, but to add options). I opened an account with TD Bank, I picked them reasonably randomly, mostly because my daughter has an account there and also they have very convenient locations and hours (actually insanely accommodating hours). In the 1st 30 days I had the account I needed to do an international transaction and went to do so at the local branch. The paperwork was a little annoying and I had to go back more than once to complete it, but in the end, it seemed fine. Unfortunately though, it wasn’t. They held up the transaction because of intervention of another internal facing department that thought there might be some risk (a very tiny part of the funds for the transaction had been deposited within a week…hey, the account was less than 30 days old so go figure. The risk was in effect less than 1% of the total amount). Anyway, I was not notified until a day later and then by the branch, not by this internal department. There was little information available (I did not know until 2 days later even the reason for the refusal to process it). The net was that they refused to execute the transaction even though I had deposited 2 times the funds required. I tweeted my frustration and once again the response was rapid. Unfortunately though, the response was “some one would call me”, but they never did (the 2nd fail in this problem, set expectations, don’t execute). The short rest of the story is that I went to the bank 2 days later, withdrew the funds in a cashier’s check with the intent of moving the funds to Union Bank while I was in San Francisco the following day, but before I left the bank, the bank manager stopped me. She promised that the transaction would be handled if only I’d redeposit the funds and that she would personally solve the issue. Finally someone owned the problem and got it resolved. My intention that day was to close that account, but I have not done so. You see the branch employees are the customer service team there, and they do in fact try to provide a positive experience. Unfortunately other parts of the bank aren’t oriented towards solving customer issues and providing positive customer experiences. The local face of customer service is a good thing, but as to recommending the bank to others, I’m reluctant to do so. Disconnected people / organizations: Customer service is an inherently people focused process. Our attempts to automate and use technology have had mixed results, some good (like self help forums) and some bad (like IVR systems…I suppose that’s good for the company in the short term, bad for the customer and company in the mid/longer term). In the end though, often delivering customer service requires the interaction of people and to facilitate there’s the need for some type of enterprise social network (ESN) that connects them. It’s not a technology issue though, the real problem is organizational silos, the inability for internal organizations to work together to solve the customer issue. Part of this is directly related to a companies definition of what is customer facing too. Most companies today define customer facing as only the “front line” personnel, and don’t think about the big responsibility that other departments have in delivering a good CX. That includes billing (getting the correct invoice), or shipping (shipping the correct item) and many other departments. In my bank example that included risk management and unfortunately they were absolutely not in any way involved in serving customers, but had direct impact on the CX. In their case, if they had the ability to communicate the issues, they could have facilitated a quick resolution that would have made a huge difference…unfortunately they were most likely not incented to do so (I’ll talk about that in the 4th issue) nor culturally inclined to think about the relationship with the customer at all. Disconnected systems: Disconnected systems create data silos. Pulling together a truly complete customer profile would provide the opportunity to deliver much better experiences. It’s just not easy and when you add in the external data sources available today, like social networks and social media, that gets even more difficult. I don’t have any behind the scenes information on the systems at either bank, but based on my happy result it wouldn’t surprise me that one of them has a much more complete profile on me, and used that profile to guide interacting with me, not so the other. Integrated data and integrated workflow are both critical to delivering good customer service. Changing Culture: In the end I suspect the biggest issue with my examples is culture. Culture is the most difficult to understand and change, but also the root of good (or bad) customer service. I mentioned Comcast earlier, they’re the best example I have of a culture that is simply not oriented towards providing good (some would argue, barely adequate would even be an improvement) customer service. Clearly changing a business culture for an organization that large and with that checkered a customer service past is a massive challenge. In my banking example over the years Union Bank has proven to me through experience that they have a culture of providing great customer service. Just the fact that they have social listening in place AND an organization to handle / own service issues raised there, is a very strong indicator of the management attitude towards the customer. Misaligned incentives to business objectives: This is often the real underlying problem for organizational issues, or at least reflects the real attitudes of management. You get the behavior you pay for, as the old saying goes. I suspect that this is a part of my bad experience at the 2nd bank, of course tied to the organizational and cultural issues as well. This issue is also one that we see often when working with companies on ESN adoption, and in general is often the issue for getting employees to collaborate more effectively. Delivering good customer service and the overall customer experience is a complicated issue for most companies. There are technologies and processes that can help work through many of the problems, particularly around communication and around data driven customer service, but still, the most difficult issues require strong executive leadership and a coordinated program to change.